Buried near Italy's Mount Vesuvius is a fortified observatory containing artifacts dating to the earliest record of human events. Only one person, the Getty Museum's Amanda James can unlock the mysterious doors that guard the chamber. But once inside, Amanda is shocked to discover evidence left behind by a notorious Biblical killer; who long ago wandered off the pages of history. When a strange relic unveils the miraculous truth about this villain, Amanda must confront sinister forces intent on suppressing her stunning revelation; before it alters the destiny of millions. 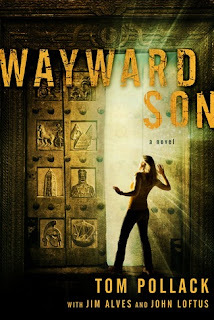 The first in a series, Wayward Son, takes the reader back in time, where ancient adventures in Egypt, Greece, China and Rome collide with modern-day intrigue and suspense. Journey with Amanda and witness the incredible story of the world's original wayward son. Amanda James is a leading archaeologist. She doesn't expect any amazing digs to come up anytime soon, but she is pleasantly surprised when she receives not one, but two offers. She decides to take Italy and heads out right away. When she arrives, she begins to suspect something is amiss. When she solves the puzzle that opens the door to reveal amazing antiques. However, Amanda triggers a switch that closes the door behind her...leaving her alone and with no way to contact the outside world. This book is very different in that Amanda may be a main character, but she is one of two. The other is the narrator, the one who explains the facts and history of the site to the reader. The reader will have different reactions to both of them, Amanda is likable and easy to relate to, but the other character will confuse the reader. They have very different traits and mannerisms. The events are fast-paced and incredibly interesting. The author describes the archaeological site in vivid detail, making it easy for the reader to picture the environment. There are historical points that add to the novel and make it so much more intriguing than it would be otherwise, the mystery adds suspense to the novel as well. This book is perfect for a young adult/adult reader.